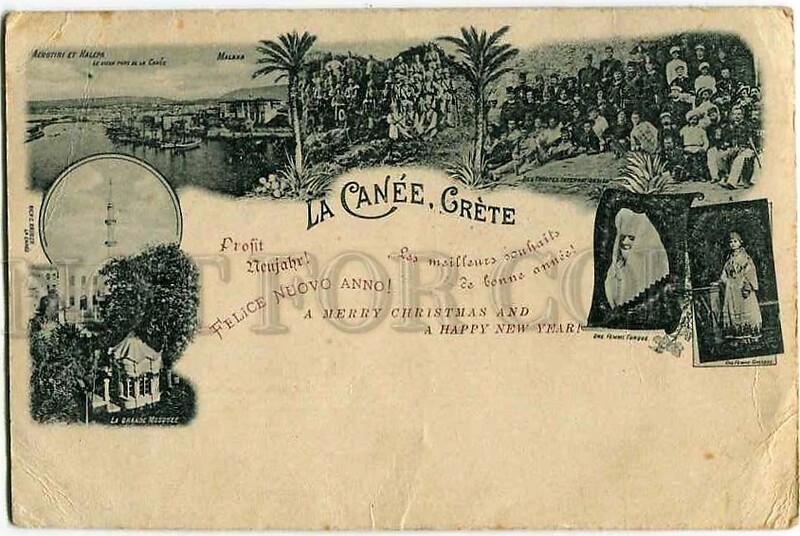 Birthday Souvenirs | The British in Crete, 1896 to 1913. While the European Intervention in Crete was carried out for serious political purposes, the seriousness of the situation did not preclude the Powers throwing the occasional party. The British celebrated Queen Victoria’s Diamond Jubilee on 22nd June 1897 with a military parade in Candia, the principle British base, and a reception there in the evening. At the reception it was reported by Sir Alfred Biliotti, the British Consul, to Sir Philip Currie, his superior in Constantinople, that the Seaforth Highlanders ‘executed national dances’ to the apparent satisfaction of the audience. Quite how satisfied the audience actually were at the sight of kilted Highlanders dancing is not recorded. Nor is it recorded that the British troops were given any souvenirs of the event. 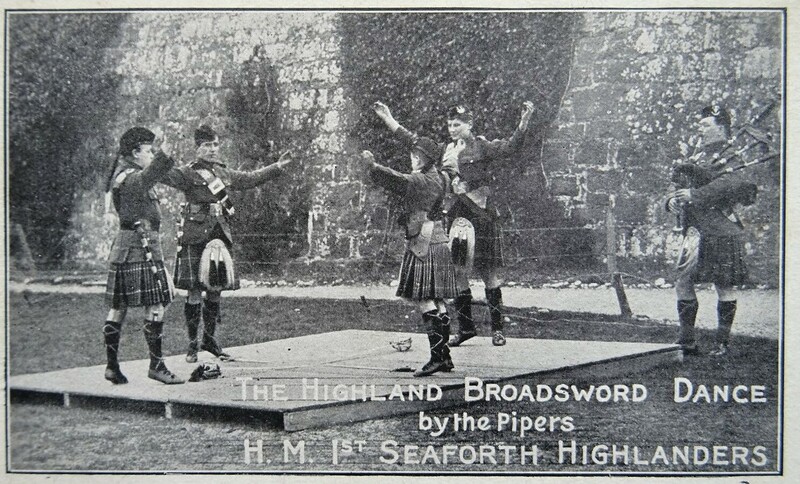 Seaforth Highlanders ‘execut[ing] national dances.’ Undated photograph. The Austro-Hungarian and German forces on the other hand did appear to produce mementoes of the celebrations held in honour of their Monarchs. 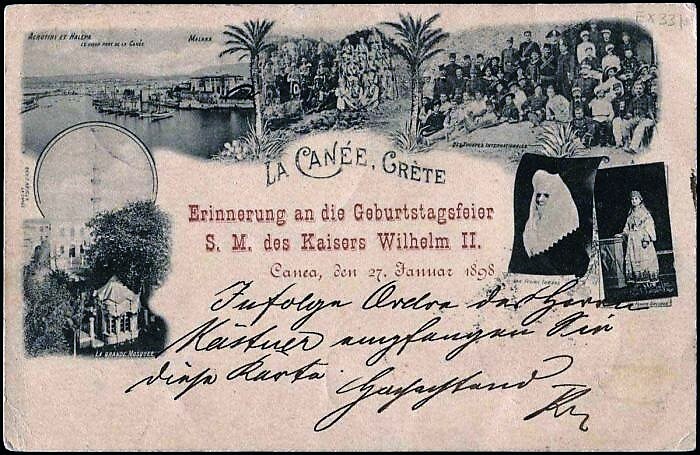 On 18th August 1897, a birthday party was held in Canea to celebrate the birthday of Kaiser and King Franz Josef I, his 67th, and on 27th January the following year a party held to celebrate the birthday of Kaiser Wilhelm II, his 39th. Souvenir cards were produced for both events, presumably to be given to those who participated. Unfortunately, it’s not known apparent whether or not the Austro-Hungarian and German troops were amongst the recipients. 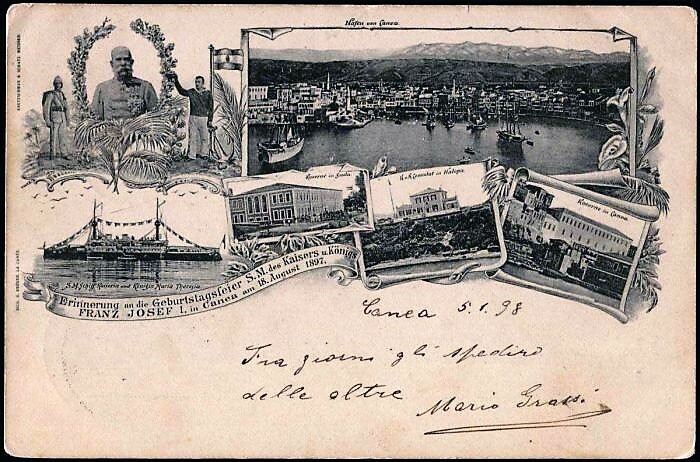 As well as an image of the Monarch and an overview of Canea harbour, the Austro-Hungarian souvenir features photographs of the Austro-Hungarian Consulate at Halepa, barracks at Canea and Suda and the Armoured Cruiser S.M.S. Kaiserin und Königin Maria Theresia. Kaiser Wilhelm birthday party souvenir. In contrast to the Austro-Hungarian card which was clearly produced for the occasion and features images specific to the Austro-Hungarian presence on Crete, the German card has nothing specifically ‘German’ about it. It is apparently a generic commercial souvenir postcard, overprinted with the souvenir declaration. The only images which could be said to relate to the German presence on the island are of groups of International troops. The definition on the image of the troops is insufficient to allow identification of German troops, although Italian, Montenegrin and Scottish troops can be made out, albeit with difficulty. Original version of Kaiser Wilhelm birthday party souvenir. One hope the German Consulate, or whoever decided on the card, were congratulated on their thrift. National Archive, Foreign Office FO 195/1983, From Crete. Sir Alfred Biliotti to Currie 24 June 1897. This entry was posted in European Intervention Crete and tagged Austro Hungarian troops in Crete 1898, Crete 1897, Crete 1898, Emperor Franz Josef's birthday 1897, European Intervention Crete, German troops in Crete 1898, Kaiser Wilhelm's birthday 1898, Seaforth Highlanders on January 27, 2019 by Mick McT.